If you live in Tampa FL you probably have more tile and grout in your home than carpet. What have you done lately to maintain your tile and grout? Although, most tile is sealed grout is porous and stains easily. Knowing how to maintain cleaner grout can leave your floors looking their best. One of the most important things when dealing with grout, is how to prevent and minimize staining in the first place. Dirt and grime build up in your grout lines from foot traffic, and dirty water left behind after cleaning. Be careful when mopping your tile floors. Dirty mop water causes dirt to get caught in the grout lines, leaving unwanted stains. You can help prevent grout stains by applying a sealant to your grout lines. The easiest way to remove loose dirt and debris from your grout is simply using water and a stiff nylon brush. With a little elbow grease, water alone will remove a great deal of dirt and grime. You should avoid bleach on colored grout, as it will discolor the grout. There are also a number of commercial grout cleaning products that can be useful in removing grime. However, be sure to test any product on a small area before applying it all over your tile and grout. Even with proper cleaning methods, it’s recommended that homeowners have their grout professionally cleaned every 12-18 months. With the use of specially formulated cleaning solutions as well as high-powered suction equipment, a professional cleaning from Chem-Dry of Tampa FL can leave your grout free of dirt, bacteria, and grime. 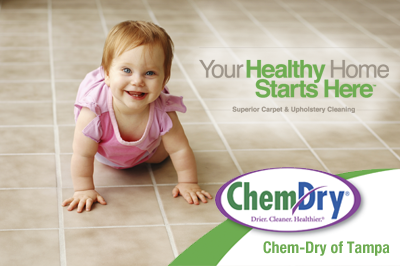 Call Chem-Dry of Tampa FL today for a free in home estimate.